OK the blog streak ended at 165 days (just 200 short in a non-election year), and lasted way longer than my plants. I was just too busy working, with the responsibilities of a TV producer and digging myself out of a blizzard. Or as they call it in Detroit, "snow," a mere 4-6 inches doesn't qualify as anything more. My 7th Detroit Bowl game was a lot like many of the previous ones, wild. The 4th quarter involved a (carried over) 9-minute drive, a 7-minute drive, a TD with a fumble upheld, a TD run overturned, a blocked punt in the end zone, and a very questionable 4th down play call. 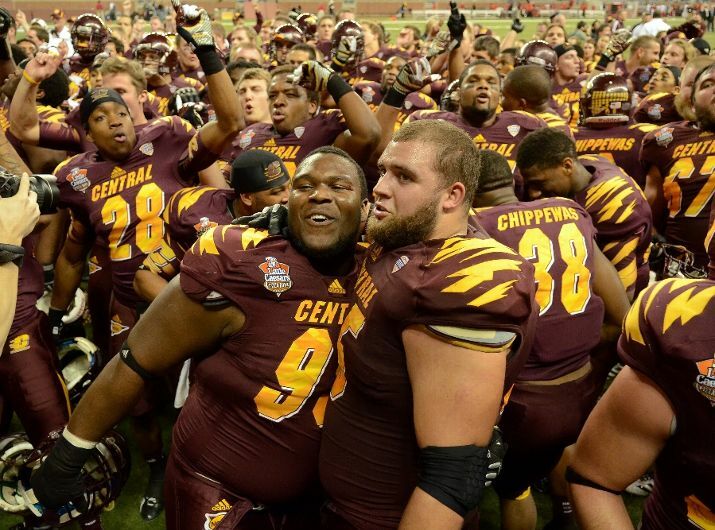 Central Michigan ultimately prevailed over Western Kentucky. The 19 buses from Bowling Green, Kentucky all managed to arrive in Detroit for the game, and several pulled up in front of our hotel after the game. It was a mad house. Not only were there 5 inches of unplowed snow in front of the hotel but they couldn't even take may car for close to an hour. The story works better visually, but I just can't take pictures everywhere I go. It was still fully dark when I dropped off the rental car in the slush at Detroit Metro in the morning. While I undersell the holidays, I know what to ask Santa for before my next Christmas in Detroit: a hat, gloves, scarf, and boots. Almost none of which are needed in Savannah...ever. My seat assignment from Detroit to San Francisco, 21D, reminded me of my first day as a Delta Platinum in 2008. I was traveling from Detroit to the Alamo Bowl in San Antonio and I drew 29E - a middle seat. Welcome to Platinum. Well I must have more clout now, because I was the first one called to be upgraded. And traveling at 30,000 feet with Wi-Fi and a charger, it was a productive and relaxing experience. I didn't mind the snow so much...while flying over Yosemite.